I knew it was you, Daxy-Waxy! Very nice photo. I don't think this particular photo lends itself to triptychization though. Doesn't make me want to stop looking at it though - technicals and aesthetics of the photo are perfect. This was one of my favorites. I was surprised it didn't place higher. Your work is beautiful and this is no exception. I love this one. It seems magical. Neat lighiting and mood. One of my top favorites. Returning for comments and a bump to (10) Perhaps my favorite of the challenge. The more I look at this, the more I like it, and added it as a favorite. Has a magical feel to and is very nicely laid out & divided. looks kinda like a Dax, which is a good thing! I love the very shallow DOF and the image by itself. I'm not a big fan of the "separation choice". The image by itself would definitely be one of my favs, but as a triptych I don't think it works quite as well. I also think the extra wide white border is a bit overkill. interesting. I like the bokeh. the focus on the shell is a bit too shallow for my taste, but you manage to bring it off. the colours and their combination is good. best of luck. I LOVE this photo. The colors, the depth of focus, everything. I'm not sure about it as a triptych, though. It doesn't ruin the photo but it doesn't really do anything to improve it, either. As a single shot, though, it's perfect. i really like the use of three different sizes. and the bokeh is really nice. it makes the shot in my opinion. i love the colors and dreamy effects! Wow, you could shave with that dof, very impressive! Call me a newbie, but I don't think I've ever seen such pretty bokeh, and on BOTH sides of the focus plane, no less, sheesh! How pretty. I love the soft blur and glow in this. How does the division of your picture into three frames enhance the photo? How does this "tell...a story or illustrates a concept or object" better than the original image? Wow! Really interesting triptych framing, but I LOVE it!! The colors and the DOF are BEAUTIFUL!! This is just an amazing photo....truly lovely. This is a cool picture, but I'm not sure how the triptych adds to the overall image. I love this! Colors are pleasing and the DOF really makes this composition spectacular. I just Love this image. It is so very chimerical. As it goes, i probably would have prefered it as a whole image rather than a triptych, but your use of the 3 differing panels was definately the best approach i can see for dividing the image. Beautiful! Very poetic. For this challenge it would habe been interesting to make the panels of the picture more original/dynamic. Really beautiful shot! I love the way you chose to divide the image. I like this image as a "whole" more than a triptych...the dividing lines seem to be more a nuisance than anything else, I wish they were gone, but then this wouldn't be a triptych...anyway...love the colors and awesome bokeh! This is just an incredibly beautiful image. 10 for the image. 6 for the triptych. Lovely shot! Colors, lighting and focus are absolutly beautiful. I'm not sure how well it fits the 'triptych' theme, I think It would be perfect without the splits, but it might have worked a little better for me if the right side had been divided in half by a horizontal line rather than it is now by the vertical line. so nothing's perfectly in focus, it seems to go against all my photo knowledge, yet i love it! i don't know why but it is VERY interesting! great shot!! This is beautiful. I love the blue and orange. 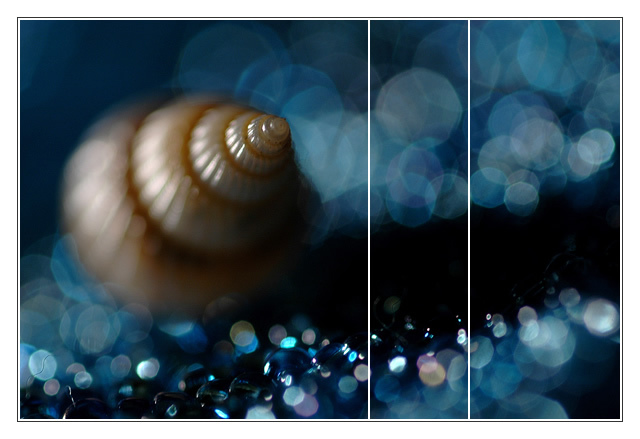 I also love that the shell has that one focal point and the rest is blurred. The placement of the breaks in the triptych is a little awkward, but I'm not sure what would have been better. OOOOOH! I love the DOF. Interesting division of thirds. Really striking and artful. I like it alot. Proudly hosted by Sargasso Networks. Current Server Time: 04/21/2019 02:57:08 PM EDT.